Two executives at IKEA France are being questioned by police as part of an investigation into allegations the company purchased police records to snoop on staff and customers, a legal source said. Ten individuals, including four police officers, have been placed under investigation. IKEA France CEO Stefan Vanoverbeke, his predecessor Jean-Louis Baillot and chief financial officer Darius Rychert were formally detained for questioning after more than a year and a half of investigation, AFP reported, quoting an anonymous legal source. French prosecutors opened a criminal investigation in April 2012 following allegations that IKEA paid to illegally acquire secret police files in an effort to gain information about staff and customers, including one who was attempting to sue the world’s largest retailer. In an effort to ease the fallout, IKEA France launched an internal inquiry into the charges and dismissed four employees. Several individuals have been charged in connection with the case, including IKEA France’s former risk management head, Jean-Francois Paris. Four police officers have also been charged and are suspected of having been paid by the Swedish company in exchange for confidential police files. Police sources were reportedly paid about 80 euros ($117.60) for each file delivered to the IKEA executives, French media reported. 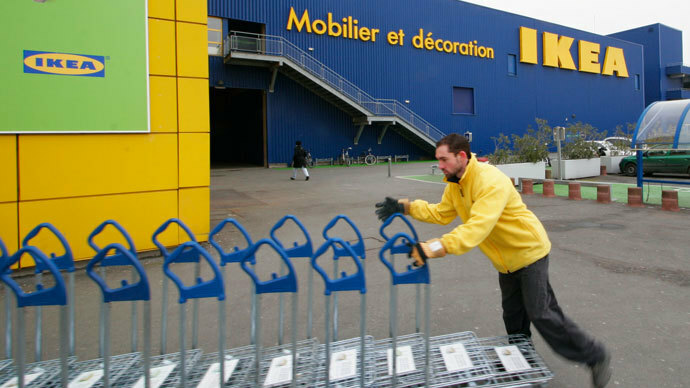 The reports alleged IKEA France attempted to gain information on its own workers, including union members, the owners of particular car registration numbers and names connected with a list of mobile phone numbers. Police conducted a search of the company’s headquarters on the outskirts of Paris 11 days ago. The questioning was expected to last until late Monday, the source told AFP. IKEA was founded in Sweden in 1943 by Ingvar Kamprad. As of October 2011, the multinational corporation owns and operates 332 stores in 38 countries. In the 2010 fiscal year, it sold $23.1 billion worth of products.